Free Shipping Included! 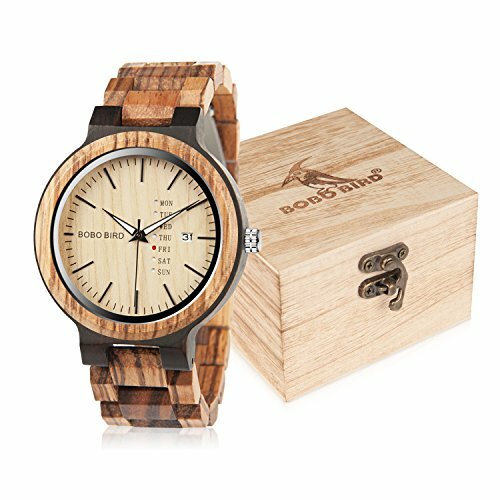 BOBO Bird Mens Wooden Watch Analog Quartz with Week Display Lightweight Handmade Wood Wrist Watch for Men (Brown Dial) by BOBO BIRD at SCRHI. MPN: 4332867459. Hurry! Limited time offer. Offer valid only while supplies last. BOBO BIRD is a manufaturer who design and produce watches, we hold our watches to the highest standards of craftsmanship, authenticity, and quality. 3. Style: Fashion, Retro, Sport and Classic Wristwatch. Natural Wood Material -- Non-toxic and hypo-allergenic. 5. 100% Guaranty & High Quality Service -- Lifetime Before and after-sale service & BOBO BIRD Manufacture Warranty. BOBO BIRD is always there and be with you. If you have any questions about this product by BOBO BIRD, contact us by completing and submitting the form below. If you are looking for a specif part number, please include it with your message.